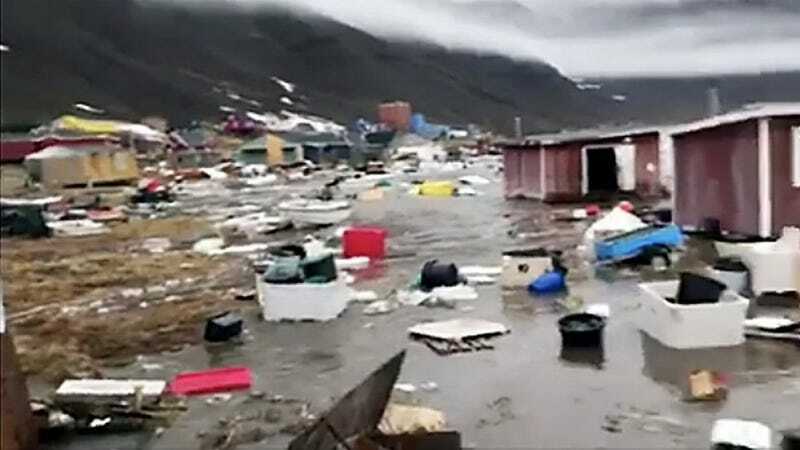 Four people are missing and nearly a dozen homes were flooded after a rare tsunami struck the west coast of Greenland on Saturday. Initial reports attributed the giant wave to a magnitude four earthquake, but speculation is emerging that the highly-localized tsunami was actually produced by a massive landslide. Peter Voss, a geologist with the National Geological Surveys for Denmark and Greenland (GEUS), told the Greenland Broadcasting Corporation that his team detected a signal suggestive of an earthquake, but that a landslide can’t be ruled out. He theorizes that a major slope from a mountain triggered the waves. “The slump has made a large part of the mountain collapse into the fjord and has created this wave,” he told GBC. The recent disaster is a reminder that Greenland is not immune to tsunamis. Back in 2000, a tsunami slammed into Disco Bay, also on Greenland’s west coast.